Styne was a vocal coach for 20th Century Fox, until Darryl F. Zanuck fired him because vocal coaching was "a luxury, and we're cutting out those luxuries" and told him he should write songs, because "that's forever". Styne established his own dance band, which brought him to the notice of Hollywood, where he was championed by Frank Sinatra and where he began a collaboration with lyricist Sammy Cahn, with whom he wrote many songs for the movies, including "It's Been a Long, Long Time" (#1 for 3 weeks for Harry James and His Orchestra in 1945), "Five Minutes More," and the Oscar-winning title song of Three Coins in the Fountain. He collaborated on the score for the 1955 musical film My Sister Eileen with Leo Robin. Ten of his songs were nominated for the Oscar, many written with Cahn, including "I've Heard That Song Before" (#1 for 13 weeks for Harry James and His Orchestra in 1943), "I'll Walk Alone", "It's Magic" (a #2 hit for Doris Day in 1948) and "I Fall in Love Too Easily". Funny Girl is Broadway's classic rags-to-riches love story about legendary entertainer Fanny Brice during Ziegfeld's Golden Era of burlesque. Its beloved score by Jule Styne and Bob Merrill is filled with unforgettable songs like Don't Rain on My Parade, I'm the Greatest Star, The Music That Makes Me Dance, and the iconic hit People. Barbra Streisand first immortalized these songs in the original 1964 Broadway smash, and yet again in the famous movie adaptation several years later. The show continues to enjoy immense popularity today with a major Broadway revival and countless productions worldwide. 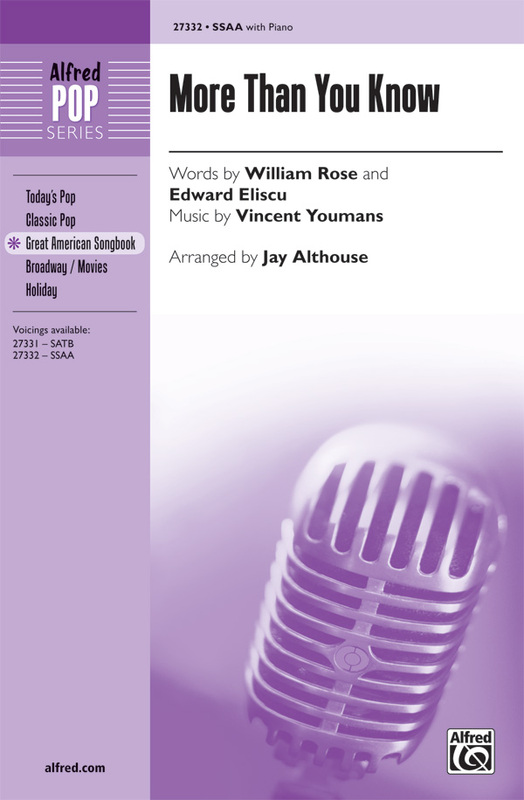 Pianists and singers will delight in this updated piano/vocal selections folio, in which the arrangements of several songs have been upgraded to better reflect the familiar original cast recordings compared to earlier printed editions. Also added is the song Funny Girl, which Styne and Merrill wrote for the 1968 movie adaptation. Contents: I'm the Greatest Star - Cornet Man - His Love Makes Me Beautiful - I Want to Be Seen with You Tonight - Henry Street - People - You Are Woman, I Am Man - Don't Rain on My Parade - Sadie, Sadie - Who Are You Now? - The Music That Makes Me Dance - Funny Girl. Eight vocal selections, including: Bells Are Ringing - Better Than a Dream - I Met a Nice Girl - Just in Time - The Party's Over - and more. 61 of his best, including: Diamonds Are a Girl's Best Friend - Everything's Coming Up Roses - Funny Girl - Let It Snow! Let It Snow! Let It Snow! - Let Me Entertain You - The Party's Over - People - Three Coins in the Fountain - The Things We Did Last Summer - and more. Also includes photos and biography. 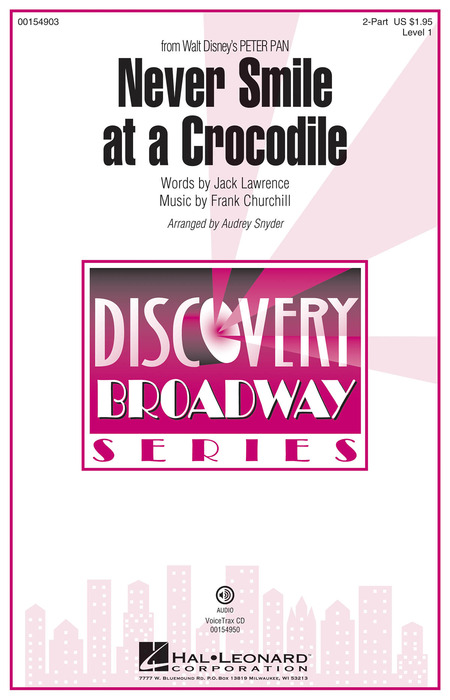 8 vocal selections from the 1954 Broadway version of the beloved story starring Mary Martin. Includes: Captain Hook's Waltz - Distant Melody - I Won't Grow Up - I'm Flying - I've Gotta Crow - Never Never Land - Tender Shepherd (Count Your Sheep) - Wendy. Displaying 1-50 of 55 items. Performed by Glee's Matthew Morrison during the 2010 Tony Awards, this sophisticated and tasteful tune from the musical Gypsy is the ultimate feature for your men. Sure to bring the house down! Memorialized by Marilyn Monroe in Gentlemen Prefer Blondes and more recently performed by Nicole Kidman in Moulin Rouge! this Broadway standard has now been superbly arranged by Mark Hayes. With lots of play between the women's voices, your choir will wow with this number. Mark has crafted a knockout SSA voicing for your ladies and written hot ensemble parts to allow you to involve your school orchestra. Available separately: SATB, SSA, StudioTrax CD, Digital Orchestration. Duration: ca. 3:26. Memorialized by Marilyn Monroe in Gentlemen Prefer Blondes and more recently performed by Nicole Kidman in Moulin Rouge! this Broadway standard has now been superbly arranged by Mark Hayes. With lots of play between the men's and women's voices, your choir will wow with this number. Mark has written hot ensemble parts to allow you to involve your school orchestra. Available separately: SATB, SSA, StudioTrax CD, Digital Orchestration. Duration: ca. 3:36. This dynamic song from the musical Funny Girl is one of Barbra Streisand's signature tunes. Its upbeat lyrics and rhythmic drive make it a concert favorite. Also performed by Rachel on the TV show Glee. This Broadway classic will forever be identified with Barbara Streisand from her role in Funny Girl. 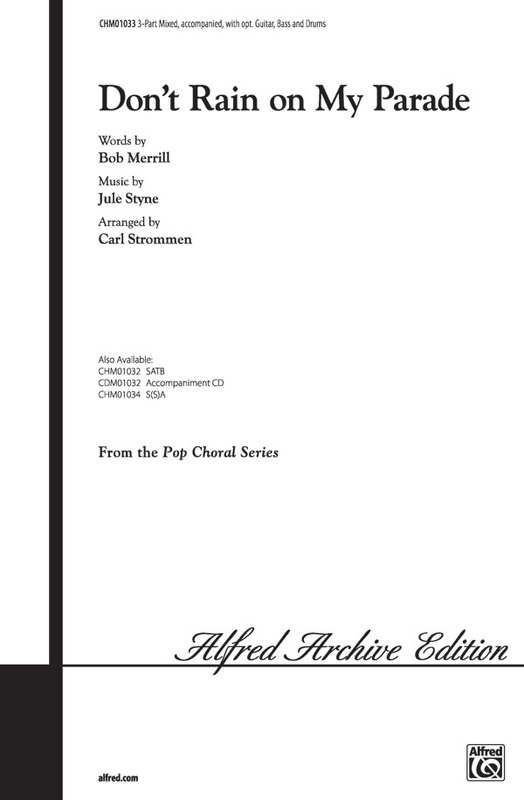 Carl Strommen's very singable arrangement will be a real audience pleaser. Leonard Bernstein's "Dream with Me" is a Broadway classic that deserves to be in every choir's repertoire. 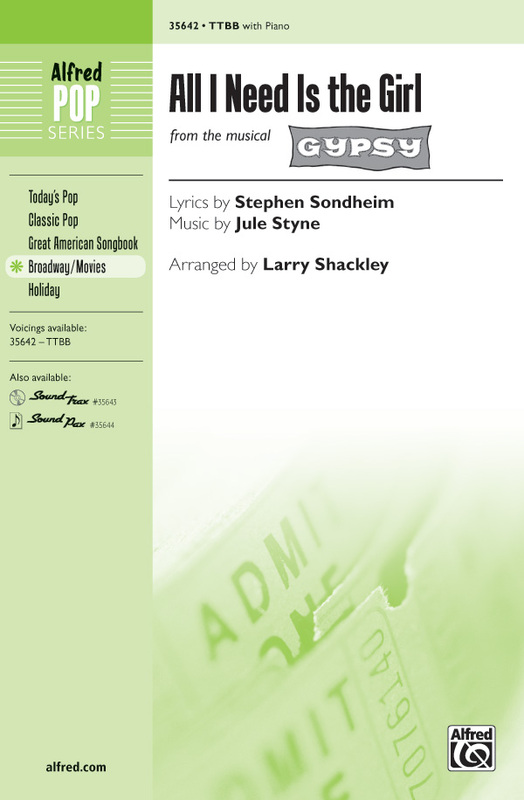 From the classic musical Gypsy comes this bright 2-beat number that's virtually a Broadway anthem. 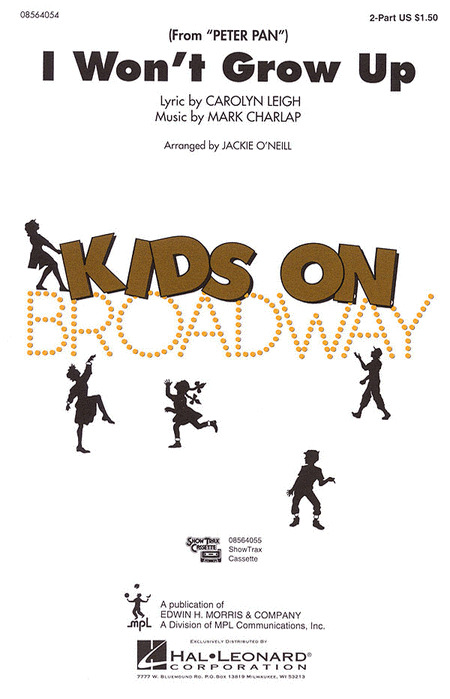 Phil Kern has kept the show-biz feel of the song intact, with a Broadway-style band accompaniment, available on the SoundTrax CD or as a performable SoundPax. A real showstopper; use it as a concert opener or closer with any of your choirs. Who can forget this famous song from the musical Gypsy that is still a modern day classic. 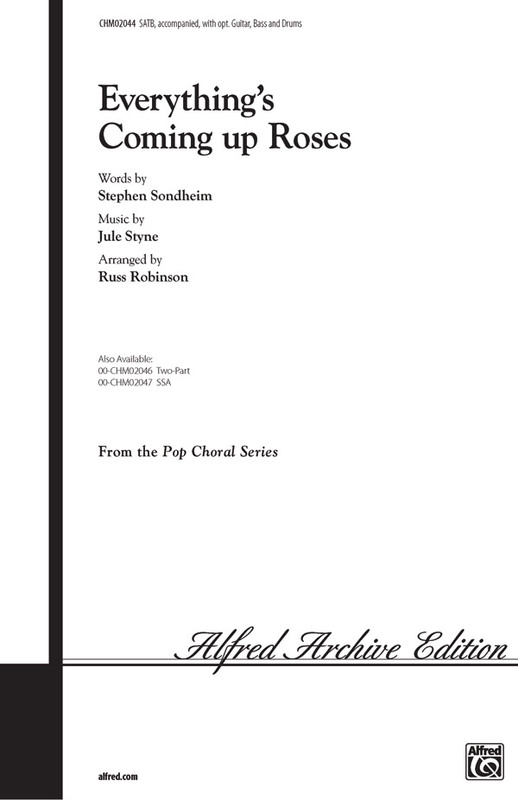 Russell Robinson's arrangement is well written and usable with all choirs. Fabulous musical theatre for young voices! The echo format on the verses and the novel kid-friendly lyrics make this arrangement of the favorite song from Peter Pan the perfect choice for developing choirs. Featured on the Danza! Movement DVD. Here's a cute number from the Broadway show Peter Pan that's every kid's secret wish! Terrific programming potential and a delightful piano accompaniment! Available: 2-Part. Performance Time: Approx. 2:10. No 2-part choir will be able to resist singing this adorable, high-flying favorite from the musical Peter Pan. Exceptional fun for everyone! Away we go! Young singers will 'crow' with excitement when you introduce them to this musical theater classic from Peter Pan. A terrific choice for any time of year, perform with the delightful SoundTrax accompaniment for an extra special touch. Sparkling, bright, happy, and simply gorgeous are a few words to describe this orchestrated arrangement by Mark Hayes. 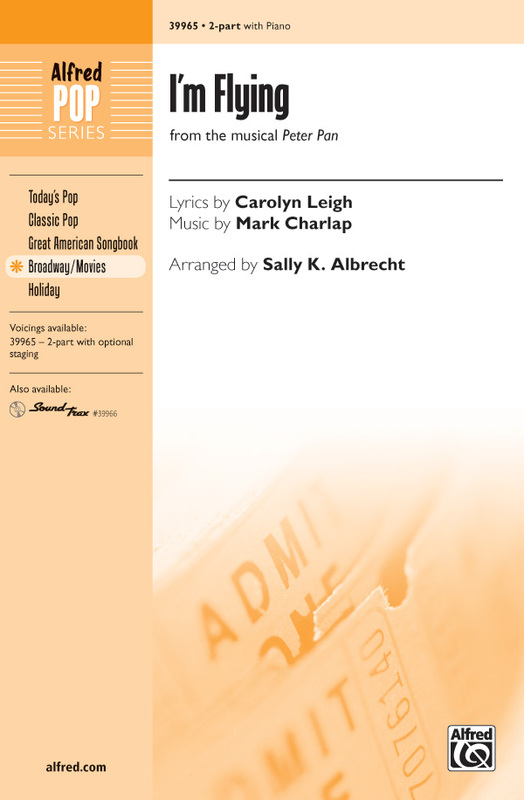 With an introduction that would surely thrill writers Sammy Cahn and Jule Styne, Mark leads into a jazz waltz that dances into an ending any Hollywood movie would dream of using and performing! Available separately: SATB, SAB, 2-Part, Orchestration Parts and Score, StudioTrax CD. Duration: ca. 3:20. Greg Gilpin : Let It Snow! Let It Snow! Let It Snow! This is not your typical arrangement of the well-known classic! A 60's groove transforms this to appeal to singers of all ages, adding a bit of novel flair. 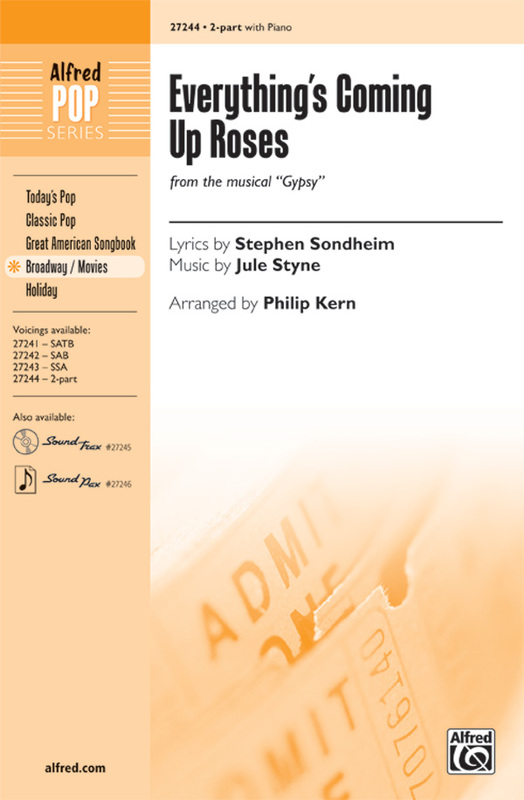 Easy vocals and harmonies in a straight eighth feel with a grooving bass line will make this Jule Styne and Sammy Cahn favorite stand out this holiday season. 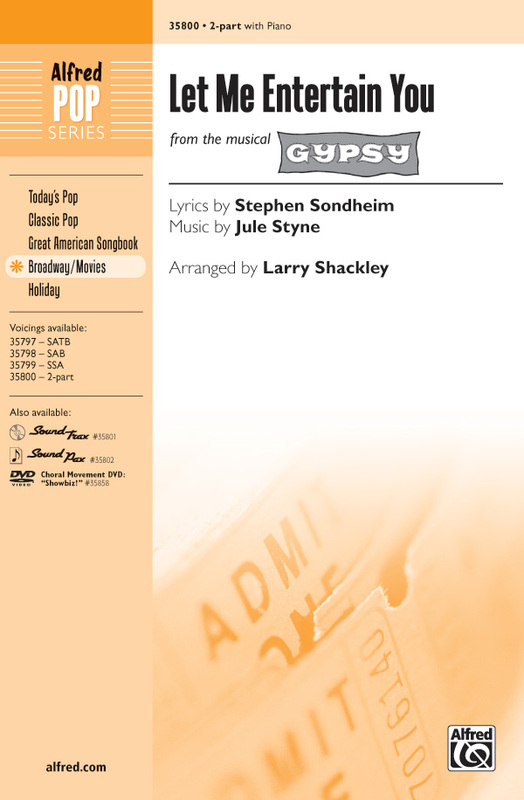 During a performance of the Tony-award winning musical Gypsy, this song is presented in many different styles. And our choral arrangement incorporates them all---from an opening 2-beat, to a gentle swing, to a lilting waltz, and then finishes with a raucous kick line! Featured on Showbiz! choral movement DVD (00-35858). Another gorgeous ballad from the Great American Songbook that has been recorded by a who's who of American singers. The lush harmonies lend themselves to performance by both large choral groups and pop/jazz ensembles. Piano accompaniment is easy and supportive of the vocal lines. 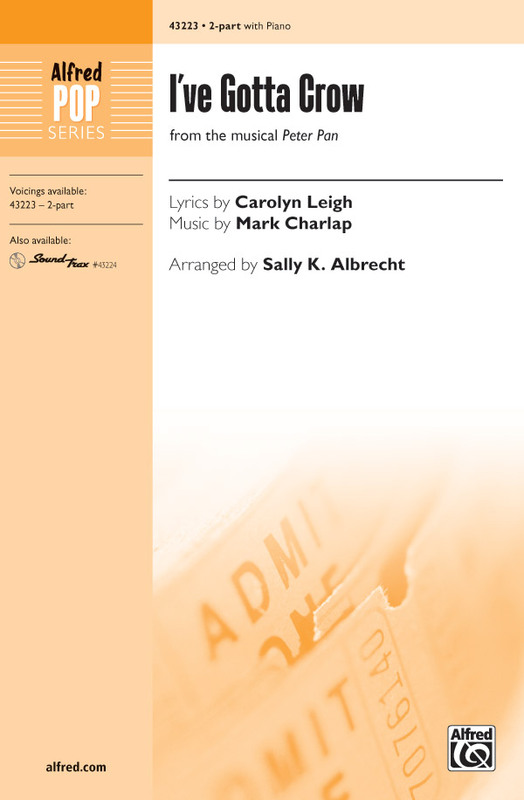 Full, rich choral writing, with an opening solo. 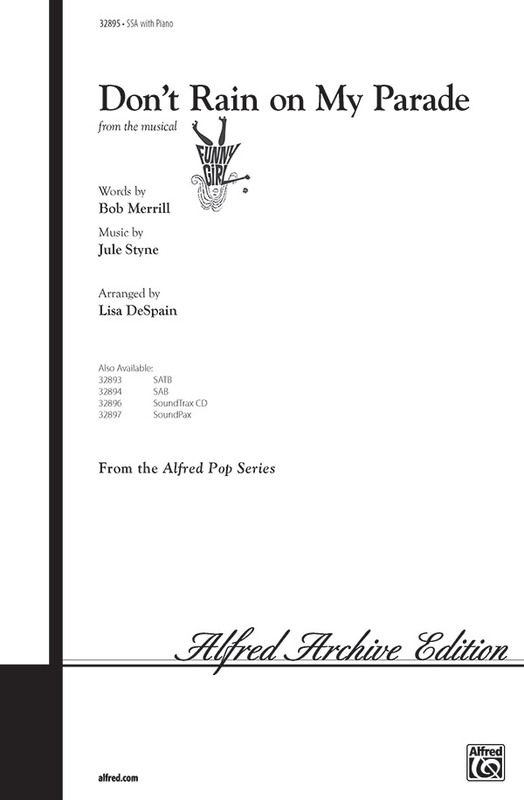 Available: SATB, SSA. Performance Time: Approx. 3:50. Allow this gentle jazz waltz to transport you and your audience to another land. 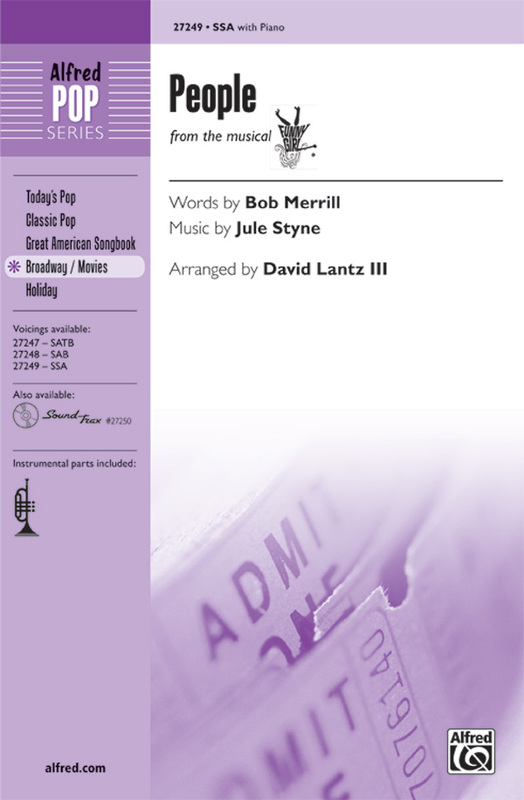 From the stage show Peter Pan, this classic will provide a treasured moment in any concert.Available separately: SATB, ShowTrax CD and IPak(R). Performance Time: Approx. 3:45. A stylish arrangement of a classy song from the musical Funny Girl. The optional flugelhorn is a brilliant addition to a very rich and performable arrangement. And the well-known lyrics are special: "People who need people are the luckiest people in the world." Here is the 1964 pop hit by Barbra Streisand in an expressive a cappella setting. The NBC Live production of this classic musical introduces a new generation to the fun and magic of the boy who wouldn't grow up and his adventures in Neverland! 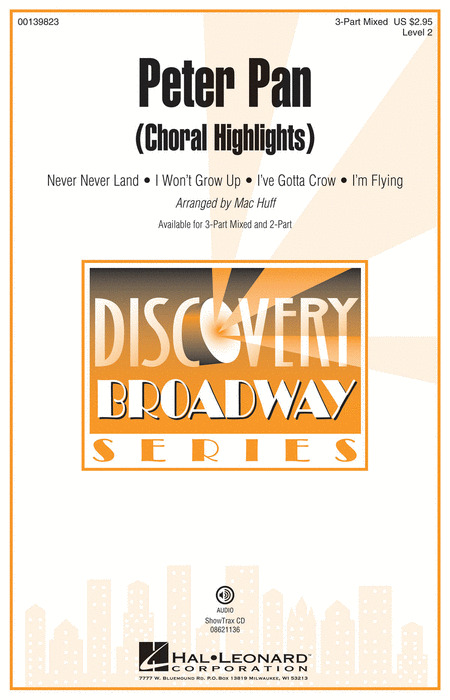 This 6-minute medley includes: I Won't Grow Up, I'm Flying, I've Gotta Crow, and Never Never Land. 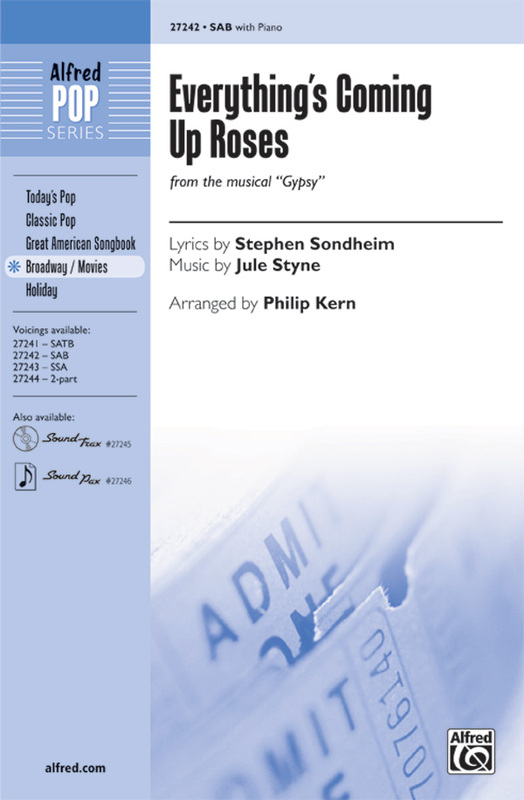 The classic holiday hit by Jule Styne and Sammy Cahn is crafted into a lovely arrangement for mixed and women's voices. Optional moments of a cappella singing and simple yet elegant harmonies keep the traditional sound of this holiday favorite while adding freshness for your singers and audience.